Your choice of lighting is an easy method to reduce energy consumption and save you money. Calculate how much in light energy savings you missing out on? Find the answers here. Enter your lighting use and see what an energy efficient equivalent can save in running costs. Individual calculations can be imported into the Group Results. 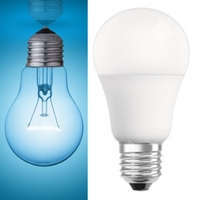 Added benefits include less bulb replacement labour and less heat output which reduces air conditioning running costs. Consider timers to further control your lighting hours. LED lights are available in 3,5,6,9,10,12, 14, 16, 18,20,22, 50, 80, 100, 200, 240 watts. Compact fluorescent lights are available in 5, 7, 9, 11, 15, 20, 24, 30 watts. LED MR16 downlights are available in 3, 4, 5, 6, 8 watts. Halogen striplight are available in 60, 100, 150, 230, 300, 400, 500, 1000, 1500, 2000 watts. Choose lights to suit your requirements and give you energy savings. How much in lighting energy can you save? Fill in the top table with values of your existing lighting, proposed lighting and its use. Then click Get Results button to see your savings over time. Power Consumption of Original light in Watts (1-200). Choose from list or select your own value. Lifespan of original light in hours (1000-100000). E.g. Incandescent 1000 hrs, Halogen 1000 hrs, Magnetic Ballast Fluorescent 15000 hrs. Power Consumption of Proposed light in Watts (1-200). Choose from list or select your own value. E.g. CFL 10000 hrs, LED 30000 hrs, LED tube 30000 hrs, Halogen Xenon 2000 hrs. Run individual calculations using the above calculator. Press a Import(1-10) button to move calculations to this table. Type in Your Light Description of the light/s. E.g.Room name or light switch group. Note the grand totals. Calculate how much light energy you could save? Print your lighting energy saving plan. Would solar lighting be a more suitable alternative? Where else can I make light energy savings? Research and calculate your options. Work out what changes will have the most benefits. Are these light energy savings worthwhile? Email or save your results. Click Export Light Group Results button. Copy text area and save as .CSV file using Notepad or equivalent text editor. Email results as is for reading or saving as CSV at the email destination.